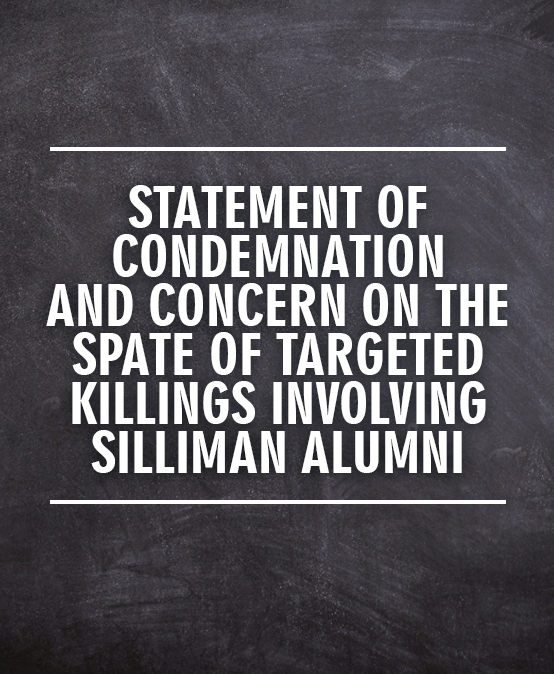 Silliman University strongly condemns the recent spate of targeted killings involving its alumni. Choosing to freely serve the poor, ailing, defenseless, and marginalized when their professions would have allowed them to live comfortable lives, Atty. Benjamin Ramos Jr. (BBA 1982) and Dr. Avelex Amor (HS 1992) lived by the Christian values and motto of their alma mater, Via Veritas Vita – the life-giving way and truth of Jesus. Atty. Ramos, a human rights advocate, gave hope to landless and oppressed farmers, environmentalists, activists, and political prisoners, providing them with free legal representation. Dr. Amor, a community health advocate, was known to care for the poor and sickly in distant barangays and municipalities, providing them, for free, medicine that he had reportedly purchased using borrowed money and/or the salary he received as a government doctor. In advocating for the rights of the people they served, Atty. Ramos and Dr. Amor were known to speak firmly against injustice and excesses in government. Deaths at the hands of nameless assailants have unfortunately cut short the advocacies of Atty. Ramos and Dr. Amor. Atty. Ramos was shot dead in Kabankalan City while helping the family of farmers who were massacred in Sagay, Negros Occidental. Dr. Amor was shot dead in Guihulngan City after he had reportedly uncovered anomalies at the Canlaon District Hospital. Their deaths may serve as a grim reminder of the vulnerability of those who speak out against injustice and corruption in our country. Silliman University demands justice for both Atty. Ramos and Dr. Amor and calls upon government authorities to conduct a full and transparent investigation of their deaths.